I’ve just roll out to a live environment, a SOA Integration project with Oracle Service Cloud Rightnow. The customer needed to migrate from a in-house CRM to Oracle Service Cloud and with my company Infomentum we have helped them in taking this big step. Since that I have made lots of experience with OSC WebServices. Here I just want to share the complex XSLT Transformation which we have implemented to communicate with the OSC WebServices, hopefully these can speed up any other SC integration projects. Out of the box Object? SC Columns in the XSLT are sometimes out of the box column, in some other cases they are custom ones. 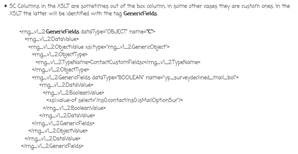 In the XSLT the latter will be identified with the tag GenericFields. Read the complete article here.